Explanation: O seal of the Prophets! O master of both Makkah and Madina! There is no one in the entire cosmos and heavens as you. Though there are many Prophets but none bedecked, honoured and privileged with Miraj like you, O Prophet Mohammad! 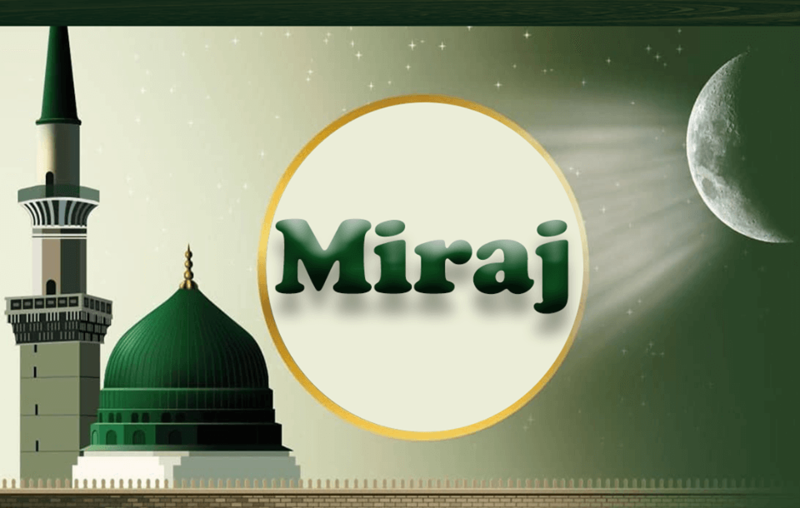 Miraj means the night ascent of Prophet Mohammad through the seven heavens to the presence of God. Moreover, this is the physical and spiritual ascent of man. The narration of Miraj never happened before that night and nor will it happen again. Hence, this is that meeting between the Lord and the slave which reveals passion of union. Prophet Moses could not bear even a single theophany on Mount Tur but the beloved Prophet of Allah, Mohammad saw his Lord on the night of Miraj. Albert Einstein laid the foundation of modern science and he developed the theory of relativity. Furthermore, according to the theory of relativity when the body moves with the speed of light, it does not stay within the bounds of time and space. Time is a measure to move each and every activity of man. Surprisingly, man has not to date devised a unit to measure infinity. Therefore science is oblivious to understand the eternal life. On 27th Rajab, in the twelfth year of Prophethood, Mohammad sall’Allahu alayhi wa’alihi wasallam was at Al-Hatim or Al-Hijr when by the order of Allah, Angel Gabriel descended and told Mohammad the will of Allah to meet him. Buraq is an Arabic word meaning lightening. It is in fact light. Moreover anything moving with the speed of light is free of time. Isra is the first part of the journey where Prophet Mohammad went from Great Mosque of Makkah (al-Masjid al-Ḥaram) to Al-Aqsa Mosque (Al-Masjid al-Aqsa). Fourteen hundred years before, Buraq with the speed of lightening transported our beloved Prophet Mohammad, physically. Isra means ‘night journey’. At the site of the first qiblah of Muslims, Al-Aqsa Mosque, the congregation of Prophets was waiting for the beloved Prophet of Allah, Mohammad. All the Prophets offered salat and Prophet Mohammad was their imam. Beyond lote tree, the Prophet went alone and found that ascend, which is a proof of him being the reason of creation. Consequently, it is only possible by the seal of Prophets and is the greatest blessing of Allah. This is eternal proof of love of Creator for the created. Then there remained the distance of only two bow lengths between the two. The Lord gave command of fast and salat. This is Miraj where there was none but the Lord and the Prophet. Moreover it was the court where there was none but the two. Here descended the direct revelation. It was complete union of Allah and the Prophet, the reason of universe. Meaning: The Lord summoned his beloved Prophet, Mohammad, beyond the inaccessible lote tree for surely this honour befits and compliments him. Prophet Mohammad saw both heaven and hell. Then he descended back to Al-Aqsa Mosque and Great Mosque of Makkah. Most surprisingly, he covered the distance in a brief time and the very next day a trial of belief of Muslims and infidels awaited and astonishment. The acceptance of this journey titled Abu Bakr as Siddiq (the Truthful). The infidels asked manifold questions from the Prophet and got authentic answers. The Prophet even told detailed signs of caravans coming from Al-Aqsa Mosque. At that time man could not think of means of transportation faster than that of horses. Miraj was beyond their intellect. Today’s man accept this reality. This is a small symbol that Allah is Almighty and even a smaller miracle by the Prophet. Miraj is an eternal gift of Lord to Mohammad. The narrative of Miraj is a proof that Allah is Almighty. Moreover, Miraj is testimony of guardian angels of seventh heaven whose leader is Gabriel and Miraj is the testimony of lote tree which was a witness of limits between the Creator and the created. Hence, it never saw even the leader of angels cross that limit. Prophet Mohammad made this journey physically and saw the Lord for without a doubt this is a blessing of Allah. Moreover, Miraj was arranged by the Lord and it is not only the ascent of the Prophet but a sign that man is the best of all the creation. I pray to Allah that He may bless us to understand the theophanies of this journey. Moreover, may He grant us the strength to offer salat with perseverance for salat was blessed on the night of Miraj. May salat become a source of proximity to Allah! Ameen. Meaning: Prophet Mohammad is the eternal and I am oblivion. The Prophet achieved everything that a man like me can only dream. He has accomplished what I can only speak. I am dweller of dust and his purpose awaits him beyond the lote tree. The difference between him and me is that I am a speck and he is the beloved. Do leave a comment or query as we would like to hear from you and for support please hit the like button.